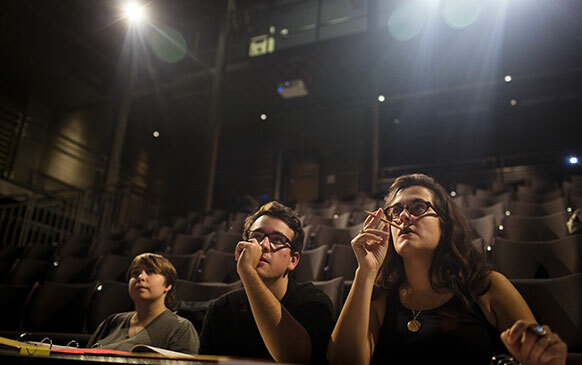 Prof. Kate Bredeson challenges students to make theatre that is both real and unreal. Theatre History I is sometimes referred to as the Hum 110 of theatre. As a means of introducing themselves, students are invited to recount a theatrical production that shook them to their core. One student recalls a grade-school production of To Kill a Mockingbird where the issue of race was abstracted by the wearing of gloves. There may be debate in the workaday world about whether theatre is still relevant. There is no debate at Reed. Theatre is a discipline that demands both intellectual rigor and practical know-how—both thought and action. Students read 18th-century French plays for insight into the social problems and moral dilemmas of the time. They also learn tips for warding off stage fright. Some will make a career in the theatre; others will take what they have learned into domains that have little to do with the smell of the greasepaint or the roar of the crowd. Indeed, experiments show that learning and problem-solving skills are greatly improved the longer individuals have been involved in theatre. It’s an exciting time in the theatre department. Building on a strong foundational program established by Prof. Kathleen Worley [theatre 1985–] and Prof. Craig Clinton [theatre 1978–2010], the department has added three new colleagues in the last few years: assistant professor Kate Duffly, associate professor Peter Ksander, and assistant professor Melissa Schlachtmeyer. 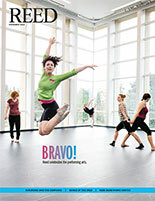 And then there’s the new Performing Arts Building. Bredeson is quick to note she is a director and dramaturg, not an actor. One suspects she was born with her commanding presence, but apart from being an avowed Francophile by the age of eight, she claims not to have been particularly theatrical as a child. Her former student Dominic Finocchiaro ’11, who has gone on to produce plays in New York and who presented his play complex at Portland’s Just Add Water festival in July, said he would cast Katharine Hepburn to play Bredeson onstage. “Katharine Hepburn in her prime would best represent Kate’s fierce intellectualism and mixture of class, sass, wit, and fashion,” he says. Growing up in Minnetonka, Minnesota, Bredeson was treated to performances at the Children’s Theatre of Minneapolis. Though she occasionally took part in grade-school productions, she was passed over for the title role in “Snow White,” and ended up playing a tree. At Macalester College she planned to major in French and studio art. Her life changed when—thinking it would be an easy credit—she signed up for an acting class. Theatre opened a window on the world of politics, history, social roles, and gender. Recruited as a props assistant on a college production, Bredeson experienced the power of collaboration and realized she’d found a home in the theatre, though perhaps not as an actor. “I was never able to get out of my head enough to just feel and be onstage in the moment,” she says. Instead, she found herself thinking about the historical and cultural conditions surrounding the plays, and how theatre worked. Her mentor, Prof. Beth Cleary, suggested she try directing and helped her secure a one-year internship in dramaturgy at the Guthrie Theater.